One day, my colleagues and I sat outside the office building with our lunch bags in tow. As we unwrapped our sandwiches and got ready to eat, someone got the conversation going by asking us what food we could not live without. One lady immediately said "cheese" and we all agreed. 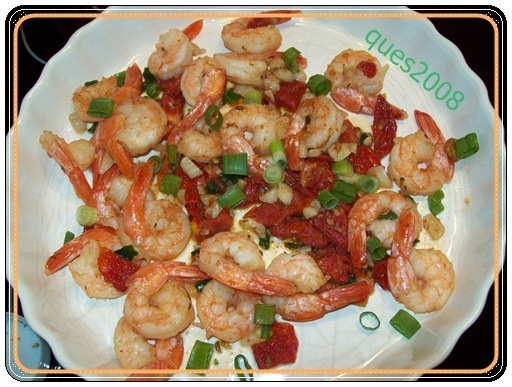 When my turn came, I blurted "juicy, fat shrimps!" They looked at me like I was either out to lunch or had just landed from Mars. Let me explain. When I was four or five years old, the doctor told my mother that I had an allergy to shrimps and that I’d probably never be able to eat them even as an adult. We were colonized by Spain (before the Americans colonized us) and because they ruled our country for 300 years, they had introduced a lot of things Spanish. The afternoon siesta was one. The manana habit was another (there ought to be a tilde on the first "n"). As for food, they introduced us to paella, arroz a la valenciana, chocolate con churros, chorizo de bilbao, and many, many others. I loved paella, but could not really bury my nose into that colorful platter of "mariscos" for fear that I’d react violently to the shrimps. I felt helplessly deprived. But time heals, as they say, and I lucked out. Over the years, my shrimp allergy slowly vanished into thin air and I was able to savor all the shrimp dishes that I missed in my childhood. I’d beg my mother for paella, "rebosado" (shrimps coated in flour and deep-fried) and shrimps sauteed in pools of butter and fistfuls of garlic. Other times, I would ask for skewered giant shrimps barbecued on the grill. My mother also had a shrimp dish that she would cook slowly throughout the day in a thick tomato type sauce that was in between sweet and spicy. What was remarkable about this dish was she didn’t remove the skin. By the end of the day, and the cooking was done, the skin was so tender that we ate it with the shrimp. You didn’t even feel the sharp gills – it was like they melted on your mouth. My mother’s culinary treats left me with fond memories. She was one person who bubbled with creativity as soon as she put on that apron. Funny, but I don’t think she ever cooked with a recipe on her hand. She’d improvise – the way she improvised George Gershwin’s pieces on the piano. I made this shrimp dish last month. I never had the time to post it. The sun-dried tomatoes give this dish that special flair and flavor. Saute your garlic in the hot oil. Add your sun-dried tomatoes. Lower heat to medium and add your shrimps with their tails on. When shrimps turn pink, sprinkle your wine. Salt and pepper to taste. Decorate with green onions before serving. What would this world be like without shrimps? I agree, cheese is indispensable. Some will give pizza, bread or cheese cake a vote of confidence, but I’ll stick to my guns and give shrimps my vote! Let’s forget about my photography skills in the meantime and focus instead on the cookies. I was never a cookie lover in my younger days and not once did I feel the urge to make them. I didn’t grow up like most 5 or 6 year olds who say, "mummy, mummy, can I help you make cookies", and then they turn the kitchen into a war zone when they’re done. No, the kitchen was not a place to hang out. When my mother would start puttering about with her pots and pans, I’d run away and hide, fearful that she’d ask me to help her. But people change. Here I am – 4 decades later – discovering the joys of the kitchen. And these cookies – I lust after them. These are the only cookies that stir my five senses and sensuality. A carnal affection – if we can say that about cookies. I have made them four times now. 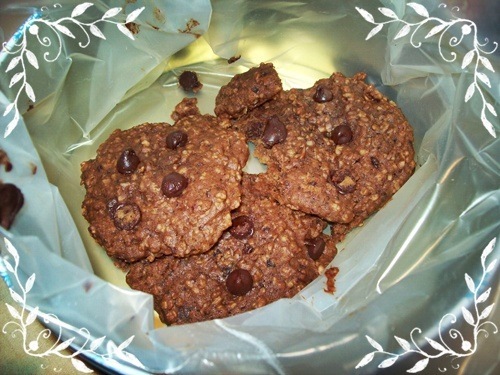 They’re called – rather simply – chocolate oat cookies. The first three times I made them, they exhibited "cookie spread" disease. I would start with small mounds of cookie batter on the sheet, and exactly 9 minutes later end up with huge flat pancakes. No matter though, they were still delicious, soft and chewy, and…un-sugary. The best cookies I’ve ever had – that’s why I don’t buy the commercial variety anymore. These are top of the line, folks. On a scale of 1 to 10 with 10 being the best, I’d give taste and texture a 12! I like butter in baked foods so the first option was out. I don’t buy shortening either. I chose option # 4: refrigeration. I scooped individual mounds onto the cookie sheet, covered them with aluminum foil and then put them in the fridge for 45 minutes. I took them out just as I was starting to pre-heat the oven. I said to myself, if this will prevent the cookies from spreading, that’s good but…will I lose that delicious taste and texture? Result: it worked! The cookies did not spread out – not even by a millimeter. And the best part – they had the same delicious flavor! These chocolate oat cookies practically melt in your mouth and they don’t clog your throat with sugar. I think I’ll make extras next time and give them away. Once they wake up your taste buds, you won’t want the supermarket kind…ever again. Second trivia: in 2001, the commonwealth of Pennsylvania declared the chocolate chip cookie as its official cookie. I don’t know that many people who like bean sprouts. Asians buy them regularly to add to soups and to green salads. They spell b-o-r-e-d-o-m to some, and their taste doesn’t tingle the taste buds. But there’s one way to enjoy bean sprouts and that’s to dress them up with meat or shrimp with a handful of other crisp greens. The trick is to saute them but not to the point that they start to wilt and get soggy. I also remember bean sprouts stuffed into egg rolls – we called them "lumpiang togue" back home and we used to douse them in spicy vinegar. Heavenly taste! I’d have a hard time getting any of my North American friends to enjoy it so I don’t really serve them to invited guests for dinner. They would accuse me of serving rabbit food, or insulting their culinary sensibilities or something absurd like that, and that I’m sure would ruin my reputation. The lady is still my friend although that incident haunts me every now and then. The only time we break bread together is to have scrambled eggs for breakfast when we meet twice a year four our birthdays. I guess there are people who don’t like to get out of their comfort zone when it comes to food. I wonder if she’ll drop me like a hot potato if I served her the dish above. 1. Wash the bean sprouts thoroughly in cold running water. Set aside. 2. Heat some oil and saute your onions and garlic – about a minute. 3. Add your green and red bell peppers. Continue to saute until soft but not soggy. 5. 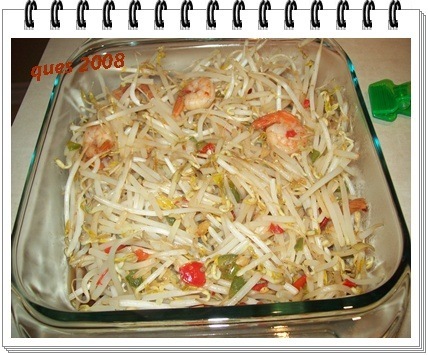 When shrimps are cooked (be careful not to overcook the shrimps), add your bean sprouts, lowering the heat. Mix the bean sprouts with the ingredients vigorously – about 1-2 minutes. Make sure they still have their crunch. Once they get soft and have shed off lots of water, I’m afraid you’ve overdone it! 6. Flavor with the soy sauce and salt and pepper. Remove from heat and serve immediately. Note: a cup of fresh bean sprouts contains 31 calories. They’re low in fat and cholesterol. They’re very high in riboflavin and manganese. 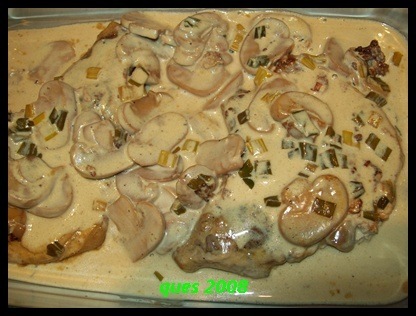 Ever tasted chicken with tarragon, cream and wine and blended with shallots? This recipe is a keeper. The taste was heavenly and I liked the fact that dried tarragon and canned mushrooms can be used. 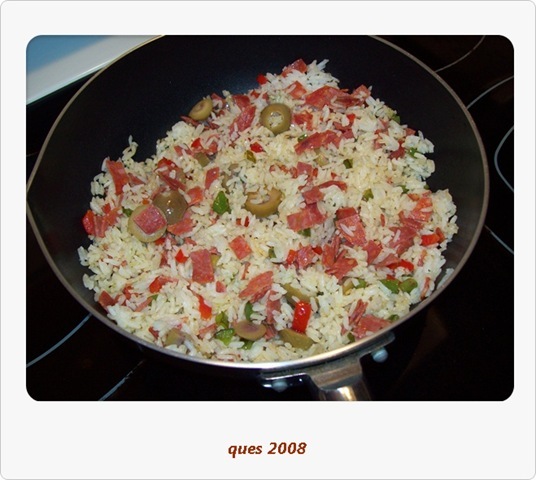 This is a dish that can be your main meal and served with either rice, soft rolls or mashed potatoes. You can pick up the sauce right off the plate with your roll or spoon it over your mashed potatoes. 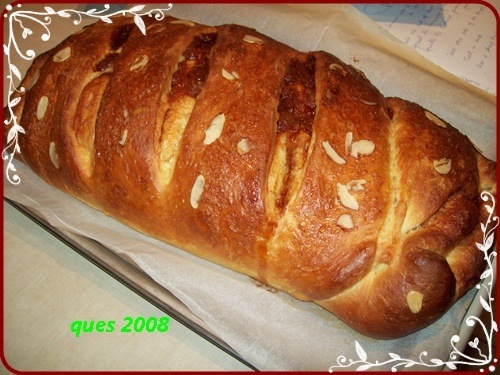 I got this recipe from Canadian House and Home (H&H) Magazine (http://www.houseandhome.com). Food editor Claire Tansey was kind enough to share it. She says it’s one dish that magazine readers “can’t get enough of.” Her recipe did not have mushrooms, but I added them anyway. * 6 bone-in, skin-on chicken supremes (mine were chicken breasts which I sliced into bite-size pieces so they would cook sooner. I imagine chicken bones would enhance the flavor of this dish). 1. Preheat oven to 400F. Heat oil in a large, wide skillet over medium high heat. Pat chicken dry with paper towel; season with salt and pepper. Add chicken to skillet skin-side down and cook 3-5 minutes, or until deep golden. Flip and cook another 2 minutes. Transfer to large baking pan and bake 20-25 minutes or until cooked through. (Note: if you’re slicing your chicken into pieces, reduce cooking and baking time). 2. To make tarragon sauce: add shallots and garlic to skillet, reduce heat to medium and cook 4 minutes, or until shallots have softened. Add wine and bring to a boil. Reduce heat and simmer until reduced by half. Add chicken broth, bring to a boil and cook 3 minutes. Strain, reserving liquids and discarding solids. Return liquids to skillet or a small pot, bring to boil and whisk in cream and Dijon. 3. Mash butter and flour together in a small bowl. Add 1/4 cup of hot chicken broth mixture and stir until combined (it will be very thick). Add entire mixture back to hot chicken broth and stir until combined. 4. Add chopped tarragon and season with more salt and pepper. Spoon sauce over chicken to serve. Serve with additional mustard, if desired. Claire Tansey presented uncut chicken pieces and they looked appetizing, although I could tell from the picture that the sauce was almost gone. My chicken pieces were chopped and I made sure there was a lot of sauce over the chicken (as in the picture above). I figured, it would be nice to “mop off” the sauce with a soft texture well-baked roll (similar to Parker House rolls). This sauce would also be a nice topping over mashed potatoes, with shallots and mushrooms dripping on the side. Tarragon is also called dragon’s wort. There are 2 kinds of tarragon used in cooking: French and Russian. The French variety is stronger in taste and is one of the 4 fine herbs used commonly in French cuisine: complements fish, chicken, egg and lasagna dishes. It is used also to make desserts – like Slovenia’s potica, a kind of nut bread with walnuts, eggs, cinnamon, lemon. Two years ago I went home to visit my father who was ill with colon cancer (he has since passed away). I was hesitant to stay with him and my stepmother because I did not want to invade their privacy, but my father insisted that I stay at his house. I’m glad he insisted because I had some of the best homemade meals cooked by my stepmother. I loved everything she cooked, just the way I loved everything my own mother cooked. When I left, my notebook must have been filled with a dozen recipes, including how to pickle green mangoes. Did you know that raw mangoes soaked in vinegar, sugar and spices make great appetizers? 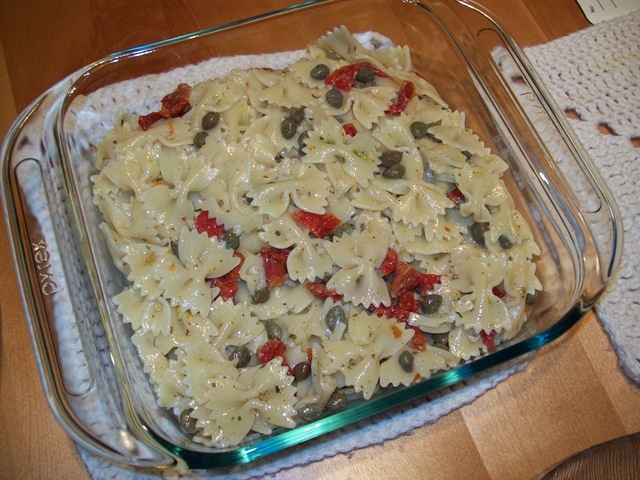 There was one dish that I liked especially – elbow pasta which she mixed in with capers, sun-dried tomatoes and basil. You can make this dish with any kind of pasta. The first time I made it I used penne, and other times I used macaroni or fusilli. Last week when I made it again, I tried bowties. My stepmother told me that she hardly makes pasta because my father wasn’t particularly fond of it. So when I visited she said it would give her a good excuse to stop catering to the whims of my father. I remember those days when we’d beg my mother for spaghetti. She always hesitated but gave in anyway, because she herself was craving it. When the spaghetti was served, my father flinched, not making an effort to conceal his frown. I asked him why he had such a reaction to spaghetti. I still couldn’t get over what he said. "They look like a pile of worms." Then he gave me that look as if to say, "why do you ask a question the answer of which is so obvious"? Oh golly, what a way to spoil one’s appetite. Dad was such a party-pooper sometimes. His food preferences were the law. He adored Chinese food (the best food in the world, he’d say). When we’d go to a French restaurant back home, he’d say, "you go and enjoy yourselves. Me? I’d rather eat at home." For all of my dad’s quirky tastes in food, I loved him dearly. Fact is, I miss eating at his table. And he could be right – Chinese food is hard to beat. But once in awhile, Italian food is just as tempting! Cook the pasta according to package directions. Run cold water over it and set it aside to completely drain. Put drained pasta into large bowl and sprinkle oil and vinegar over it. Add remaining ingredients. Salt and pepper to taste. Keep tasting as you’re mixing, until you’re satisfied that the taste "bites". Refrigerate for a couple of hours so the ingredients have time to blend. Serve with a green salad and garlic bread. Maybe a chilled glass of sangria with that?